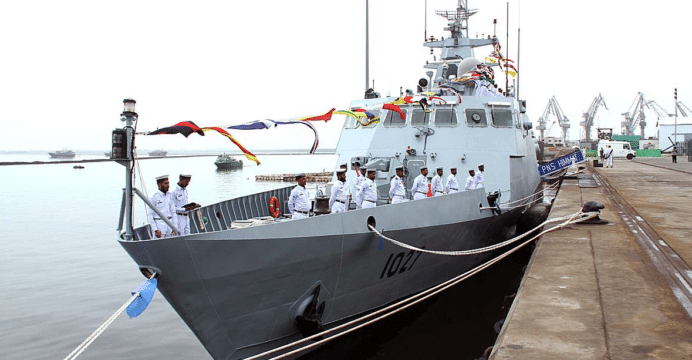 The Pakistan Navy has commissioned its third Azmat–class Fast Attack Craft (Missile) – i.e. FAC(M) – on Friday, July 28 at Karachi Shipyard & Engineering Works (KSEW). Designated PNS Himmat, the ship had undergone sea trials since September. It will join the PNS Azmat and PNS Dehshat, which were acquired off-the-shelf from China Shipbuilding and Offshore Company as part of an order for four FACs in 2010. 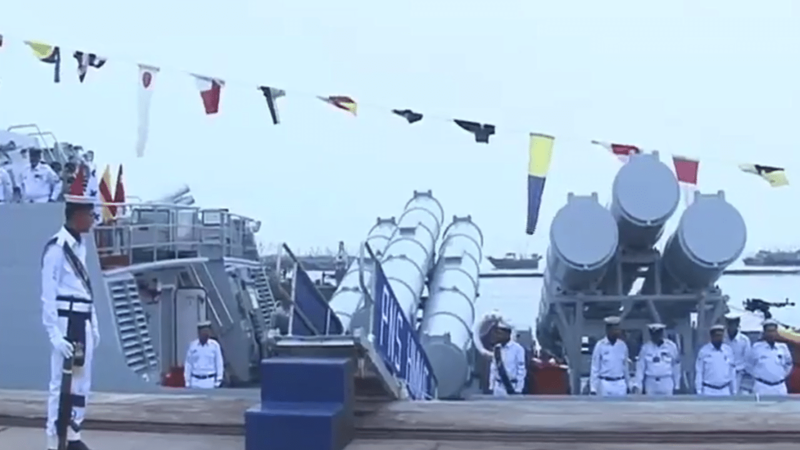 While based on the Azmat FAC, KSEW states that the PNS Himmat has an “indigenously built (sic) Missiles System.” Imagery of the PNS Himmat show that it has a dual triple missile launcher identical to the one planned for the fourth FAC(M) (which entered production in March 2017). In addition, the PNS Himmat also eschews the forward-mounted twin 25-mm cannon of the Azmat and Dehshat in favour of a new remote-controlled stabilized turret, possibly the Aselsan STOP. The 560-ton Azmat-class FAC is 63 m in length and has a maximum speed of 30 knots. With a cruise speed of 18 knots, the Azmat–class FAC can reach 1,000 nautical miles. The PNS Azmat and PNS Dehshat are armed with dual quad-cell C-802 anti-ship missile (AShM) launchers. It is manned by a crew of 15. The Pakistan Navy’s Chief of Naval Staff Admiral Muhammad Zakaullah stated that transfer-of-technology in shipbuilding is a necessary component of the Navy’s modernization efforts. It is also a requisite element for supporting Pakistan’s defence exports. 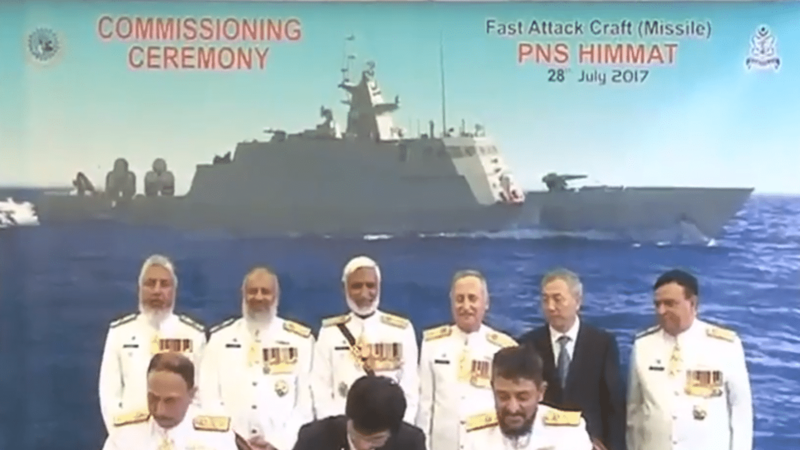 KSEW also announced that the Pakistan Navy signed contracts for 1,900-ton offshore patrol vessels (OPV), one 3,000-ton survey vessel and two fast-response boats (for Pakistan Customs) in the previous fiscal year. The PNS Himmat’s missile-launch system appears to be the one Pakistan’s Ministry of Defence Production (MoDP) listed for development in 2014-2015. As per the MoDP yearbook for 2014-2015, the Directorate General of Munitions Production (DGMP) had been tasked with “the indigenous (sic) developing of ship-borne system with Land Attack Missile [LACM] and Anti ship Missile” by October 2018. The dual-AShM and LACM role would imply that the launcher would need to be sufficiently large for the Babur LACM and an alternate AShM. The latter is unclear. In April 2016, the Pakistan Navy announced that it tested a “Zarb” shore-based AShM. In March 2017, the Navy tested a “long-range” AShM, but it did not designate it as the Zarb, leaving the possibility that it was a different AShM. Pakistan’s Inter Services Public Relations says that the Babur Version 2 LACM can engage targets on land and at sea. It is apparent that the purpose of the new launcher is to deploy long-range missiles for anti-ship and land-attack engagements. It is likely that the Babur will be a factor, at least to the extent for serving as the LACM option, though an AShM form (by including a terminal-stage seeker) is, albeit in theory, plausible. Otherwise, large AShMs may be sought, such as the C-602 (which is speculated to be in Pakistani service as the “Zarb”) or potentially the supersonic cruising CM-302. Pakistan’s Maritime Technologies Complex (MTC) was responsible for modifying the FAC(M) design. Navy officials also told Defense News that FAC(M)-4 – which too will feature the new missile launcher – would include new internal subsystems and weapons, which may even include surface-to-air missiles (SAM). It is not known if the Pakistan Navy will acquire additional Azmat-class FACs once FAC(M)-4 is complete. During Pakistan’s biennial defence exhibition IDEAS in November, the Pakistan Navy told local media that it was considering the purchase of four to six new FACs, for which it began talks with China and Turkey. It would make sense to see the Navy continue with the Azmat FAC design, but with further changes to the hull, layout, internal system and weapons. However, different requirements – such as a greater emphasis on speed and improved stealth – could steer the Navy to a new clean-sheet design. Alternatively, the inclusion of the new dual-AShM/LACM launcher and additional weapon systems could encourage an enlargement of the FAC(M) into the territory of a small corvette. While MTC has shown that the FAC(M) can possess long-range attack capabilities, its defensive suite potential is likely limited to a point defence missile system (PDMS), such as the FL-3000N or pedestal-mounted SAM. The inclusion of a LACM also implies a role for attacking India’s western coast (via LACM), which may require an increase to the ship’s combat radius, endurance and defensive aids, including anti-air warfare (AAW). Structurally, the Azmat FAC design is in an awkward area. First, it is not as fast nor as stealthy as emerging FACs, such as the Savunma Teknolojileri Mühendislik ve Ticaret A.Ş. (STM) FAC-55, which STM offered to the Pakistan Navy for its follow-on FAC requirement. The FAC-55 has a top speed of 55 knots (in contrast to the Azmat FAC’s maximum speed of 30 knots). Second, the Azmat FAC is also comparatively close in size to small corvettes, such as the Swedish Visby (640 tons, Emirati Baynunah (915 tons), Israeli Sa’ar 5 (1,275 tons) and Turkish Delta Marine C-1200 (1,200 tons). However, the latter set of ships are also more capable in AAW and anti-submarine warfare (ASW). In fact, at 27+ knots, the C-1200’s maximum speed is only marginally slower than that of the Azmat FAC, yet it has a ferry range (at 15 knots) of 3,000 nm and an aft flight deck for a 10-ton helicopter. Instead of letting the FAC(M) grow into a small corvette with limited value as a FAC or multi-role ship, the Pakistan Navy could perhaps consider rigidly demarcating the two ship classes: a stealthy FAC and a small corvette. A small corvette design analogous to the Turkish Delta Marine C-1200 could retain the FAC(M)’s long-range strike package, but with internal room for lightweight ASW torpedoes and/or a vertical launch system (VLS)-based SAM system. An FAC could be much smaller and shorter-ranged, but with a strong emphasis on speed and low-detectability. The Pakistan Navy has been searching for an affordable avenue for building a capable surface fleet, and that too with participation from MTC and KSEW. One option could be to commission MTC to design and develop a light multi-mission corvette analogous to the Sa’ar 5 and C-1200. In peacetime, these ships can operate as effectively as OPVs in policing Pakistan’s exclusive economic zone (EEZ). In wartime, they can deploy long-range AShM and LACM but also possess defensibility against aerial threats through VLS-based SAMs as well as bolster Pakistan’s ASW coverage in its littoral seas (via ASW torpedoes).